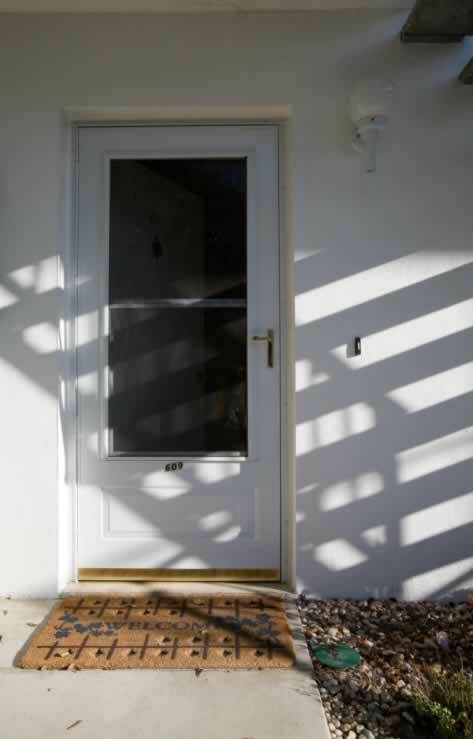 This white, two panel storm door provides additional insulation against cold weather and wind and serves as an auxiliary door to this residence. The top panel is not a lite, but a sash window. The difference is that panels of glass that are fixed windows are considered lites, or lights in the United Kingdom. This window's top pane is fixed, and the bottom pane (also known as the sash) is movable and will overlap with the top pane when open. The window is also fitted with a screen, so that when the sash is up, air can circulate into the home. The door has a brass door lever. Additional hardware includes a door sweep on the door's bottom rail. However, the door's sill is very narrow with a step, causing any dirt or rubbish that the door sweep catches to be deposited onto the welcome mat. This is not ideal, as the dirt can then be tracked into the home.